In Sattvinfo.net sections there is a lot of information about Geostationary satellites, the signal from which it is possible to receive if there is appropriate equipment. The pages of our website provide information on transponders, frequencies and channels, coding standards and signal decoding. 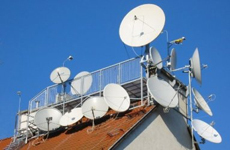 Also there is information about the equipment: Satellite antennas, convectors, receivers (tuners), information on installation and adjustment of satellite dish and equipment. Particular attention is paid to the coverage areas of satellites. these data must be taken into account when choosing a satellite, buying TV packages, channels, and ensuring a confident reception. Section Satellites. This section contains a list of satellites organized in the order of the satellites in the orbit of the sky from East to West. Satellites are distributed according to their degree positions. Clicking on the link of the satellite - the page with the table of parameters, transponders and frequencies, satellite TV and radio channels will open. Section HD Channels , Ultra HD Channels contain data on the placement of satellite TV channels in Ultra HD and HD, are coding system signal transmission formats, format recording and playback.